Home > Non Invasive Tests > What is an Electrocardiogram (ECG)? Now used as a routine part of assessing a patient’s health and as a diagnostic tool, electrocardiograms were developed in the early 1900’s as a way of monitoring the activity of the heart. The beating heart is caused by an electrical process that occurs within the organ. 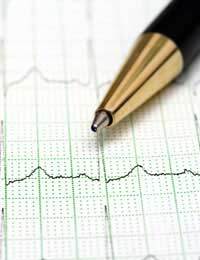 An electrocardiogram, or ECG test, aims to measure this electrical activity and interpret it into a way that can be read and assessed by a trained professional. There are many reasons why someone would require an ECG to be performed. As they are easy, inexpensive and provide very valuable information, they are used routinely on any patient that presents with problems of the chest, heart or circulation. They can assist in the correct diagnosis of many conditions affecting the heart and lungs and will often be required before any surgical or invasive procedures in those with any type of history of cardiac problems. Most patients who present with symptoms of chest pain, breathlessness, or palpitations will be asked to undergo an ECG. The test can show irregular heart rhythms, deficiencies in some minerals necessary for a healthy heart rhythm, coronary artery disease, angina or heart attacks.They are also very useful in assessing the effectiveness of treatments and medications and can be performed to discover this information. Once a problem has been detected, further tests such as more detailed scans may be required to determine the exact location of the problem, or a diagnosis can be made from the results of the ECG and a treatment plan devised. Many people who are experiencing chest pain on arrival will need to simply stay as still as possible in order to achieve an accurate reading.For others, the test will require the person to lay down whilst a series of 12 leads are placed in strategic positions (the chest area, wrists and ankles), which will be attached to adhesive pads that stick to the skin, which allow the heart to be monitored across a variety of planes, giving a more accurate reading. This may be followed by repeating the test whilst undergoing physical activity to assess how well the heart copes with additional stress. The test takes just a few minutes, and results are displayed on either a screen, strip of paper or both, which can then be read by the healthcare professional. The test itself is painless and should not be uncomfortable unless the physical exertion causes discomfort.The results are more detailed if the patient is still when required and if the sticky pads have good contact with the skin, which can be compromised by excessive body hair or sweating causing the pads to become unstuck. There are no side effects or risks associated with ECG with the only harmful risk being an allergy to the adhesive substance on the sticky pads. These reactions are normally minor and will clear up after a few days. The development of the ECG has proven to be a valuable tool for physicians and allows for early diagnosis of many cardiac problems. They have now become a routine part of health care routines and practices and sometimes can help detect problems before any symptoms are experienced.